See how a teacher of chemistry recorded it. This is an enquiry as to how credibility of evaluation can be established. Let's examine how far it is true. The teacher had assigned one project and a class test in one subject in I Term. Out of 10 = 8 (in SEP). The same pupil scored 16 for seminar, 14 for assignments; 10 for records and 15 for class Test. Total score =55/80 ie out of 10=55/80 = 6.7= = 7. But finally what will be her scores? This is natural. It is right too. Please convince the parents at the class PTA. In the beginning the school year scores were given out of 20 for each item. The latest order instructs to calculate it out of 10. For convenience give score out of 20 and convert them as out of 10. Should we share the results of evaluation in the class? The results of continuous evaluation are shared in the class room. Discussions on the evaluating indicators, need for improving their general standards, how to improve them, what activities to be done in classroom etc. have to be discussed in the class. Pupils should be guided to improved learning . Encourage them and more attention should be given to those who require it. This sharing of ideas should help each learners to understand her strengths and weaknesses in each item. We should follow in approach to improve their self confidence. Give sufficient Explanations along with SEP. Publication of Evaluation Results - what is to be published? Scores of continuous evaluate- programmes should be recorded in the relevant formats before 15 January 2005. This should be published on the school notice board after the approval of school Exam Board. 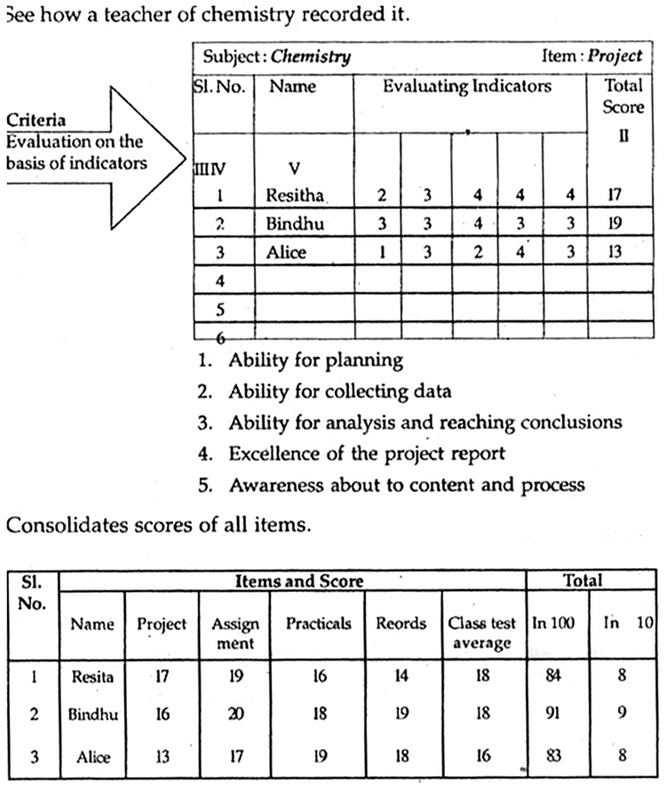 Continuous Evaluation Results are to be published on 31 January 2005. How to publish the evaluation results? The teacher for each subjects should show the pupil the record of the progress of the individual after entering scores an each items for evaluation and the total score. Copy of consolidated score sheet of the learners as per the continuous Evaluation should be published on the school/class notice-board. It should be attested by the Headmaster. This should be informed to pupils and parents with proper notice. Department of General Education has issued clear instructions to resolve problems/ address complaints if any in the-matter of continuous evaluation. 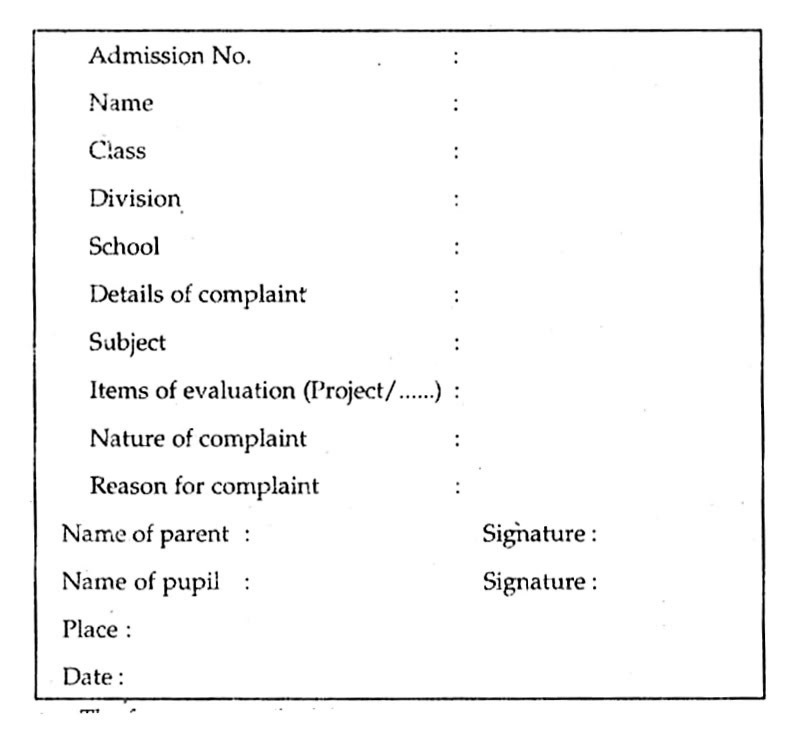 Complaints in the prescribed format may be submitted to the HM of the school after the publication of continuous evaluation results. Complaints should be registered with in 3 days. Complaints are numbered and recorded in a separate register. This register, if demanded, may be submitted before higher authorities for verification / scrutiny. A decision on the complaint should be taken within 7 days. Portfolio means the records which are to be maintained as the part of continuous evaluation. Subjects wise portfolio should include the above records. Need not compel the pupils to spend money in spiral binding/comb binding / bond paper etc. They should be hand-written except for IT. Each item of the portfolio should be assessed and signed by the teacher concerned. Report on the assessment and completion of portfolio should be presented before the HM, if required. Before publication of the results of evaluation the items in portfolio may be distributed to parents for verification, if demanded. It may be exhibited in the classroom. During the publication of results, the portfolios should be kept in schools till the completion of verification by the appeal committee. Preparation of daily planning notes (Teaching Manual) and helping pupils in their activities. While pupils are engaged in doing projects/seminars/ assignment, conduct interim evaluation and provide necessary help on the basis of the findings. Consider projects/seminar etc. as learning activities and approach them also as evaluation tools. Prepare and use formats to record continuous evaluation results in advance. Identify the stages at which the progress is to be evaluated. Understand the implication of the indicators in order to evaluate it. Share with the learners weakness and strength found out. Conduct feed back sessions and make your own contribution for improvement. Make use of the service of the support mechanism fully, provided by the Department of Education. Present the features of new approach to curriculum and evaluation, practical experiences and their effects in the learning process before the class P.T.A. Also arrange exhibitions on the learning activities. Take a creative role in the academic activities of the school as an effective member of the subject council. Identify and make use of possibilities of the Action Research to solve class room learning problems.